This photo was taken on October 3, 2018 at 3:10 PM. The location was in Chevy Chase, Maryland. The "Take It!" came as I stepped over the curb to proceed to the parking lot of the high rise building in which my Primary Care Physician is located. 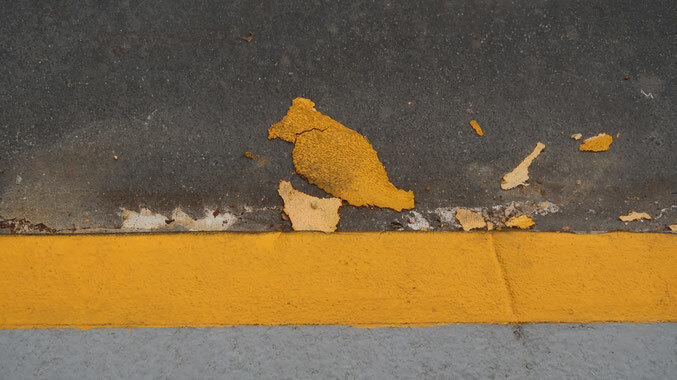 The curb was one that had been painted yellow with so many coats of paint that it finally was unable to hold the additional layers of this warning color any longer. Almost all of us have seen this before, for it seems to be a common maintenence issue as to when is going to be that last coat of paint before all of the old caked up layers have to be scraped off to allow fresh paint to be applied to the raw curb surface - and thus start the game all over again. Sometimes this last coat of paint separates and falls off and has a nondescript look to it. In this photo a chunk of paint had a distinct shape of a bird. The After Take: All to whom I have shown this photo to - have enjoyed joining me in the wonder of the randomness of the shape of the paint chip. I think it is large enough a piece to qualify as a chunk, given the material from which it is formed does not usually produce recognizable shapes. And, yes, we laugh together at how well the assembled words in the above line - are ever so fitting. There is an old saying about every day being a gift, I think we can safely say, this is only the beginning, as each day has many gifts as offerings, it is up to us to see them that way. Thank you for sharing this little unexpected gift with me. It’s yellow but it looks like a blue jay. It looks like it’s perched on its own little nest. LOL “This bird is a chip that does not chirp.” I found that hilarious! Probably doesnt taste as good as the real thing.